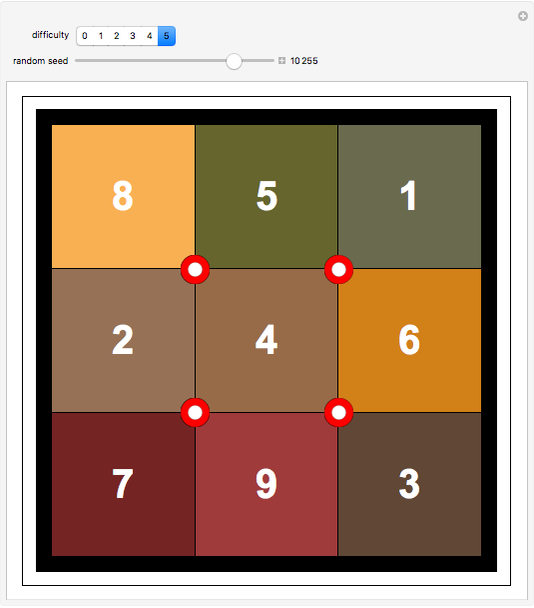 Permutation puzzles are games that test your ingenuity. In them, some pattern is rearranged according to some fixed rules not involving chance, giving rise to a new pattern that subsequently needs to be directed at a prescribed goal. The paragon of this type of game is Rubik's Cube. This Demonstration presents a permutation puzzle played on a 3×3 board with labeled squares. Click a red button to rotate the four squares around it by a quarter turn. Choose the difficulty of the game, which is a rough measure of how many buttons have to be clicked to reach the position with difficulty 0, having all squares in order. To undo a move, click the last button used three more times. D. Joyner, Adventures in Group Theory: Rubik's Cube, Merlin's Machine and Other Mathematical Toys, 2nd ed., Baltimore: Johns Hopkins University Press, 2008. J. Slocum, D. Singmaster, W. Huang, D. Gebhardt, and G. Hellings, The Cube: The Ultimate Guide to the World's Bestselling Puzzle: Secrets, Stories, Solutions, New York: Black Dog & Leventhal Publishers, 2009. Jaime Rangel-Mondragon "A Rotating Puzzle"